Q: Should I only tag the NTFS partition? Are you doing an incremental or differential such that Reflect is using an existing XML file which would have your old disk configuration. The error is saying the expected configuration of the disk described in the XML file does not match what it is finding on the selected disk. A new Full should correct the problem or you can edit the XML file by right-clicking on it and select edit and go through the wizard, IIRC. This is correct. 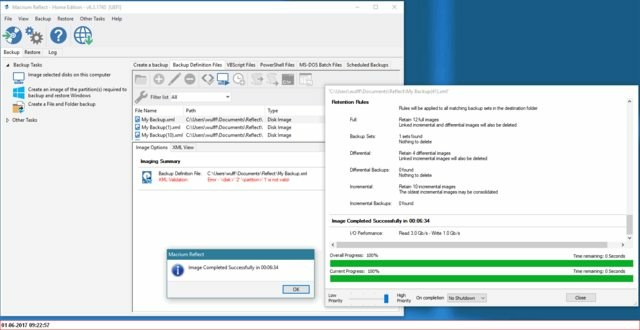 For disk images, Reflect will only build Incremental/Differential images if the partition map is EXACTLY the same as when the Full was captured. I would edit your definition file to re-specify your disk with the new layout and then perform a new Full. You absolutely want to capture all of those partitions, however. Wow, that's really irritating that it put the EFI and Recovery partitions AFTER your main OS volume. You have 48GB of space that you can't expand your main OS partition into as a result! If you don't intend to use that for another partition, after capturing a new Full image of your disk, you could boot into Rescue Media and perform a restore that involves rearranging those partitions if you'd like. 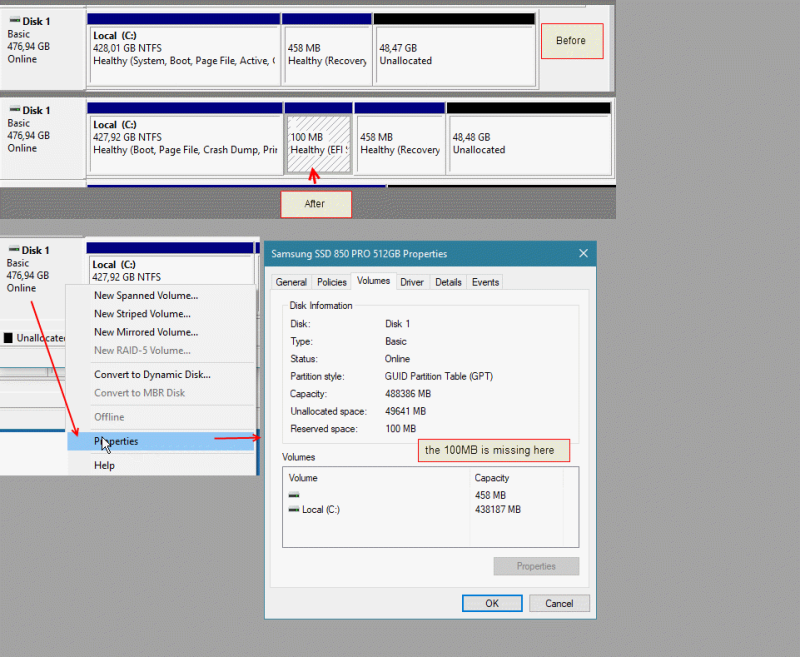 In the source to destination setup wizard, drag the EFI partition down first, then the OS partition and expand it to maximum size MINUS the size of the Recovery partition, then drag the Recovery partition down. That will allow future Windows build updates to expand the size of the Recovery partition by poaching space from C if needed (which they've done already), but in the meantime you use as much capacity as available for your C drive. Thanks to all for commenting. 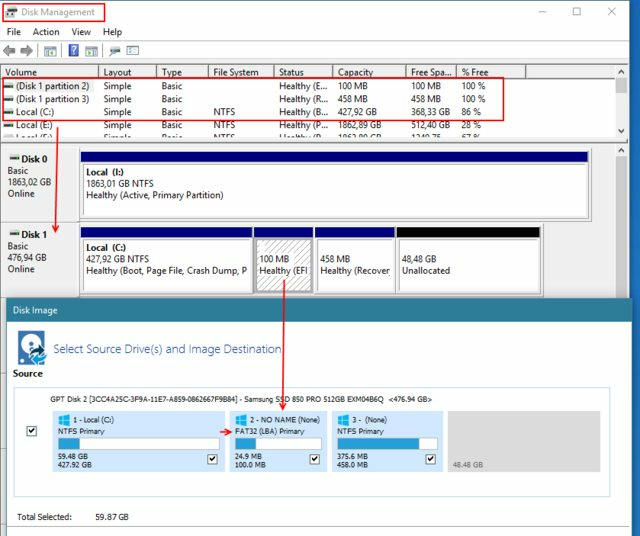 3) the 48GB partition is a fixed/necessary 'Reserved space' serving for SSD overprovisioning and has always been there since first use. 4) I did a full disk image just before the UEFI/GPT conversion, no problem. The EFI partition is created as part of the MBR to GPT conversion because systems that boot in UEFI mode do not necessarily support NTFS natively. Some UEFI systems do, but it's an optional rather than required part of the spec, so the EFI partition is formatted as FAT32 (support for which IS required in the UEFI spec) and contains the files to boot the system and read NTFS volumes. UEFI systems always look for a boot file at a defined path, which obviously requires that they support the file system used for the partition where that file resides, whereas MBR disks can store executable code in certain defined areas of the disk, which is how NTFS support is implemented for Legacy BIOS systems and why they never needed a separate partition for boot files -- unless BitLocker was enabled, in which case the Recovery partition was used to boot the system and handle BitLocker decryption. But even if a new partition hadn't been created, just changing the partition layout scheme from MBR to GPT would have been enough to break your definition file since Reflect would see that as a completely different disk. b. the 'XML Validation' error referred to the very first (old) one. Anyway, I deleted all XML files and again created a disk image. Now there are no problems. I too have the same issue...and reading the post realized I had the old disc info so I deleted all references to all backups and xml files and then did a new image but am still having the same error that there is no .XML file to be found. Should not running a new Full image create a new .XML file since all the old ones have been deleted? Reflect identifies MBR and GPT disks by the disk "signature", which is created when the disk is initialized -- but it changes when converting a disk from one partition layout to the other because MBR and GPT disk signatures are structured differently. You wouldn't have needed to delete all of your definition files and schedules though. You could have just right-clicked the definition file, selected Edit, and changed the source disk to the new "instance" of your converted disk. With respect to your question, "Should not running a new Full image create a new .XML file since all the old ones have been deleted? ", I'm not sure what you're asking. 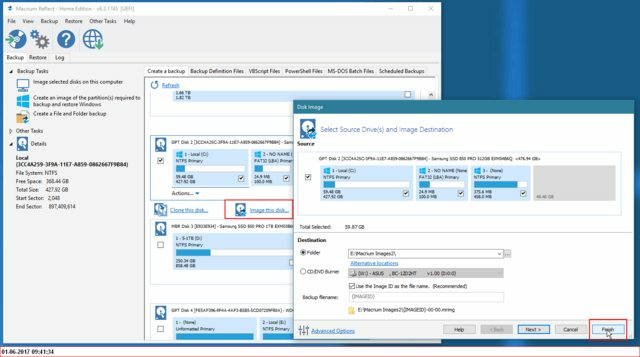 You would get a Full image the first time you backed up that disk after conversion even if you wanted an Incremental, because again Reflect sees that converted disk as a completely separate entity, so it wouldn't append Diff/Inc backups to other backups that were created prior to the conversion. However, simply running a backup does not automatically generate an XML file. The XML files describe a particular backup job, so you can create an XML file for a job without actually running it immediately, and conversely if you just need to perform a one-off backup, you can define a backup job and choose to run it without saving the job you just set up as an XML file. If you want to create a new XML file, just go through the steps you normally would to set up a new backup, e.g. click "Image selected disks on this computer" under the Backup Tasks heading (or click "Image this disk" under the desired disk in the "Create a backup" tab area), then specify all of your desired settings in the wizard: destination, compression, encryption, schedule, retention policy, etc. Then when you click "Finish", make sure to leave the "Save job as XML file" option checked, and optionally uncheck "Run now". Guess I'm confused on what an XML file is because every time I try to run a backup I get the 'no xml file' error message... I didn't before I changed the partition type from MBR to GPT. I've set up my system to copy All Drives (C: with the OS an three data drives F: S: Z to the S:drive. What I did was after converting my OS drive (C from MBR 2 GPT I also got the latest ADK Deployment & Imaging Tool from MS because when I initially set up Reflect I was using the older 2015 version... after updating that to the 2017/2018 version I also ran the Reflect Wizard to create a new bootable USB after making sure that was all good (by booting with the newly created USB) I started getting errors when Reflect would run on schedule and would have to manually go in an run a backup. Running those backups I would get the before mentioned XML error messages plus the Log files would show Red X's saying those scheduled runs could not be executed. I went to Control Panel>Programs and Features and ran a repair install of Reflect but that didn't seem to help.